For nearly 50 years we have provided exceptional service locally to thousands of residential and commercial customers. Water Tec of Tucson was started in 1967 by the DeGrave family. Originally the DeGrave family was primarily performing residential service, sales and installation of water treatment equipment in Southern Arizona. 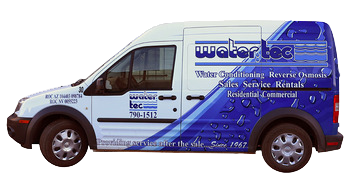 Over the years Water Tec of Tucson added commercial service, sales and installation to serve restaurants, hotels and other commercial institutions. In the early 1980’s the second generation of the DeGraves became involved with the company under current ownership of Leigh DeGrave and his wife Jennifer. Water Tec has expanded to have offices in Phoenix, Las Vegas, and Mexico. In 2007 Water Tec of Tucson, to better serve its customers, moved from a 20,000 square foot building to a 40,000 square foot building at 4601 S. 3rd avenue. This facility has allowed Water Tec of Tucson to have one of the largest warehouses, and manufacturing facilities in the western United States. Not only do customers in southern Arizona have one of the largest inventories in the Western United States but they also have access to a staff with over 200 combined years of water treatment experience. To better serve its customers Water Tec of Tucson opened a centrally located showroom and warehouse in January 2014. The new showroom location at 3333 N. 1st Avenue is a convenient location to see the latest technology in water treatment, purchase supplies and have access to a staff to answer any question or to help with do-it-yourself projects. Water Tec of Tucson provides a wide array of services including repairing all makes and models, preventative maintenance programs, convenient salt or potassium delivery and installation of equipment by our own installers. Our sales representatives are non-commissioned, low pressure sales people that are sure to listen to your needs and only recommend and quote what is necessary to solve your water issues. That low pressure non-commissioned sales approach saves you thousands of dollars when compared to our competition. Water Tec has always strived to provide unparalleled service at a fair price which is evident in its Better Business Bureau A+ rating and Angie’s List customer service award winner for 2012, 2013 and 2014. Water Tec of Tucson is licensed, bonded and insured in Arizona and Nevada.